Dr. Rajesh Bagai joined Ironwood Cancer & Research Centers in August 2013. He earned his medical degree at the age of 23 from Northeast Ohio Medical University, having completed the six-year honors program in medicine. He completed residency and fellowship training at University Hospitals of Case Western Reserve University in Cleveland. Dr. Bagai went on to work at the prestigious Cleveland Clinic. During his time at these institutions, he participated in clinical research trials to develop novel treatment strategies and has presented his findings at the American Society of Clinical Oncology Annual Meeting. Dr. Bagai is a member of the American Society of Clinical Oncology, American Society of Hematology and the American Medical Association. He specializes in several solid tumors and hematologic disorders. He is board certified in Internal Medicine, Medical Oncology and Hematology. 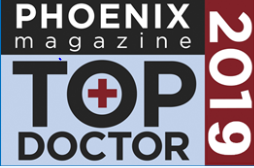 Dr. Bagai was recently recognized as one of Phoenix Magazine’s Top Doctor’s in 2018. He is married with two young sons and enjoys tennis, basketball and traveling in his spare time. Dr. Bagai is fluent in English and Hindi and accepts patients at our Glendale and Avondale locations.